The Southern Manufacturing Show had echoes of trade shows from days gone by. Despite the bitterly cold weather the aisles were filled with visitors from all over the world. With a large number of UK exhibitors this show truly brought the manufacturing and electronics sectors back to the forefront of UK industry. Line One Sales has become our new UK Distributor from 1st December 2011. On the way home from the restaurant we spot our first Rolls Royce in China. 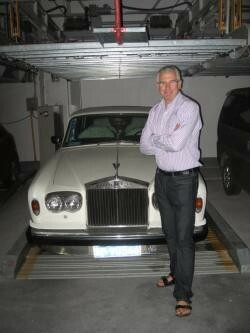 We met the owner who is a somewhat of car buff, with no less than 10 cars (including a 1974 RR and a Stretch Limo…). I wonder what Chariman Mao would have made of that?